Although the original recipe called for instant oats, I used ordinary gluten-free ones (without grinding them down) and they worked perfectly. However, it is important to measure out the ingredients correctly otherwise they will may end up too crumbly. 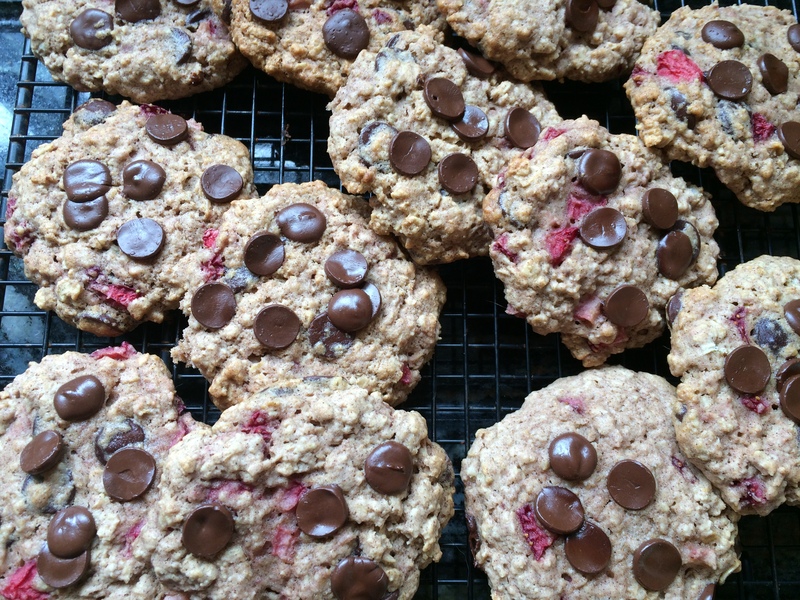 Coming across a piece of fresh strawberry in the cookie was a real bonus and made these cookies extra special. This quantity made 14 cookies and I found that if I was very careful, I could roll the cookie mix quickly in my hand before putting it on the baking sheet. If I held it too long, it went very sticky so I had to work extremely quickly. Mix together the oats, flour, baking powder, cinnamon and salt. In a larger bowl, whisk the coconut oil, egg and vanilla and then stir in the maple syrup. Add in the flour mixture, just folding it in. Add the strawberries and about half of the chocolate pieces. Chill the mixture for at least half an hour in the fridge. Preheat the oven to 325°F and line a baking sheet with parchment. Drop spoonfuls of the mixture on to the prepared sheet, flattening slightly with the spoon. Sprinkle the remaining chocolate over the tops. Bake for about 14 minutes and allow to cool slightly on the baking sheet before turning out on to a wire rack. These cookies will keep for up to a week (if they last that long) in an airtight container in the fridge, or for about 4 days on the work top. This entry was posted in Sweets and Treats and tagged Chocolate, Cinnamon, Cookies, Gluten Free, Healthy Eating, Oats, strawberry, Wheat-Free. Bookmark the permalink.